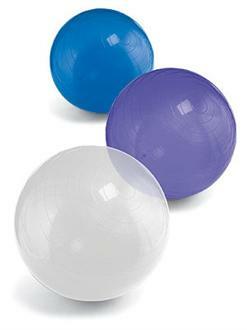 Physical therapists and dancers use Yoga Balls in a variety of movements. In yoga, these air-filled balls provide support for poses such as backbends, hip openers and restorative poses. Made from durable vinyl, they can support up to 600 lbs. Balls are shipped uninflated and include a small hand-help pump. Consider the Deluxe Ball Pump as a replacement or for easier pumping. I bought this ball for my 84 year old mother who was suffering with pain in one of her legs. Performing physical therapy exercises with this ball is gradually bringing her back to the energetic and active person she was. Needless to say, I and my brothers and sisters are very pleased with what this ball has accomplished. Email your friend about the Yoga and Fitness Ball. Ask a question about the Yoga and Fitness Ball.